Melissa toured CP24 through the VERY cool Casabubble at The National Home Show. Interior designer, Melissa Davis, shares easy installations that can make a bang without busting your budget. Creating a built-in home office, whether it’s in the basement, or adjacent the kitchen can be done on a budget using stock kitchen cabinets like these from Ikea. Use matched end panels to clad the underside of the uppers for a more finished, custom look. Top them off with a stock counter. Custom fireplace built-ins are on most homeowners wish lists for family room renovations. Custom can be costly and this means they are often cut from the budget. Here Ikea stock kitchen upper cabinets were installed, toped off with a matched white kitchen counter. Matched panels fill the caps between the fireplace and the walls to create a seamless look. Finish it all with simple white shelves on white brackets. Custom stone counters can cost as much as the kitchen cabinetry, especially if you prefer something a bit more unique like soapstone. Laminates have come a long way! Here laminate was used, custom ordered with finished sides to allow for this popular waterfall design on the island. 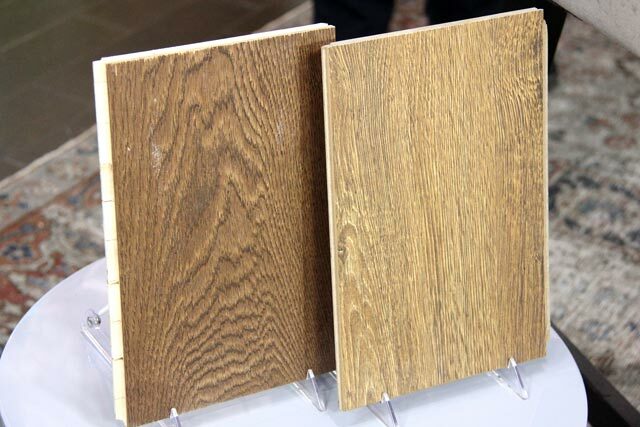 These are from Balanger Laminates, Sequoia Soap Stone material. If it’s the look you’re after, you can have it without paying for real stone. There are also many stone composites and creative installation methods that allow for a real stone material on a budget. This a product from Granite Transformations. The material itself is only 1/4″ thick and is mounted on a sturdy plywood substrate. This thinner material means less material cost, but to the outside eye you’d never know the difference. It’s heat and stain resistant as is typical of most composites. Melissa had a photoshoot today with Scott McGillivray and Tim Sellars, on the set of HGTV’s Income Property. This is NOT a Professional shot, but still a great capture of the trio.